I stumbled on something cool, this fun book for kids: The World Almanac. I don&apos;t like Justin Bieber. Sorry. I think I look at him sort of like how my parents looked at my obsession Duran Duran. What&apos;s the big deal? He&apos;s not cute (unlike John Taylor, who was just dreamy *sigh*). His music is horrible (do you remember how you felt the first time you heard The Reflex? *sigh*). And, with apologies to Selena Gomez, his personal life is of no interest to me (John didn&apos;t have a personal life because he was waiting for me to marry him...until that Juicy Couture founder came into the picture - grunt). My point? Every generation has something that the other generation doesn&apos;t &apos;get&apos;. It&apos;s been status quo since the dawning of man, when the second caveman liked a particular tree and the first caveman grunted his disapproval. That&apos;s why I think like things like almanacs are so important. They aren&apos;t true history books, that touch upon only historical events. They are everything books. They cover history as well as what it&apos;s like to be alive in this day and age today, and what that encompasses...sports, music, news, celebrities, money, etc. This latest edition of America&apos;s bestselling children&apos;s reference book just went on sale August 14 and is a must-have for all back-to-school lists. It&apos;s actually fun to flip through this book as a parent, and even more fun to watch your kids get excited about learning about their world. They can even pepper their favorite sports teams and music stars (yes, Bieb&apos;s on the cover) in with U.S. history, technology and more. It&apos;s a homework helper, reference source and entertaining read all-in-one, with vivid maps, Internet research tips, test prep guides, and even advice on cloud computing. Faces & Places: There are vivid photographs showcasing the year&apos;s most talked-about events in movies, music, sports, news...it&apos;s everything from the sad death of Trayvon Martin to the uplifting final flight of the Discovery space shuttle. Animals: Did you know that the world&apos;s smallest animal is a bumblebee bat at 1.1 inches long? Creepy. Nations: They can learn all about what the U.N. does (hopefully the U.N. knows what it&apos;s doing too) and fun facts about different countries. Health: Why you need to eat, what you need to eat and how you can burn it off to stay healthy is the covered in this section. The list goes on...travel, fashion, energy, space, environment, world currency, green living, sports, movies, video games, and populations. Each section is broken down in clever ways with huge call-outs of fun facts and trivia, along with charts, photos, and sidebars. It&apos;s would be a big help when you want your child to learn sans laptop. You know...the old fashioned way...by reading a book. Some things new this issue are features such as 2012 election trivia, fashion &apos;Blasts from the Past,&apos; &apos;World&apos;s Youngest Billionaires&apos; and &apos;Viral Video Stars.&apos;? Because we didn&apos;t have the later two when we were little. Since this is the 2013 edition, it can sometimes feel like an exercise in travel into the future. So the only thing I wish it had in addition to all the pertinent information about the upcoming election is...who wins? I just hope it&apos;s not the Biebs. 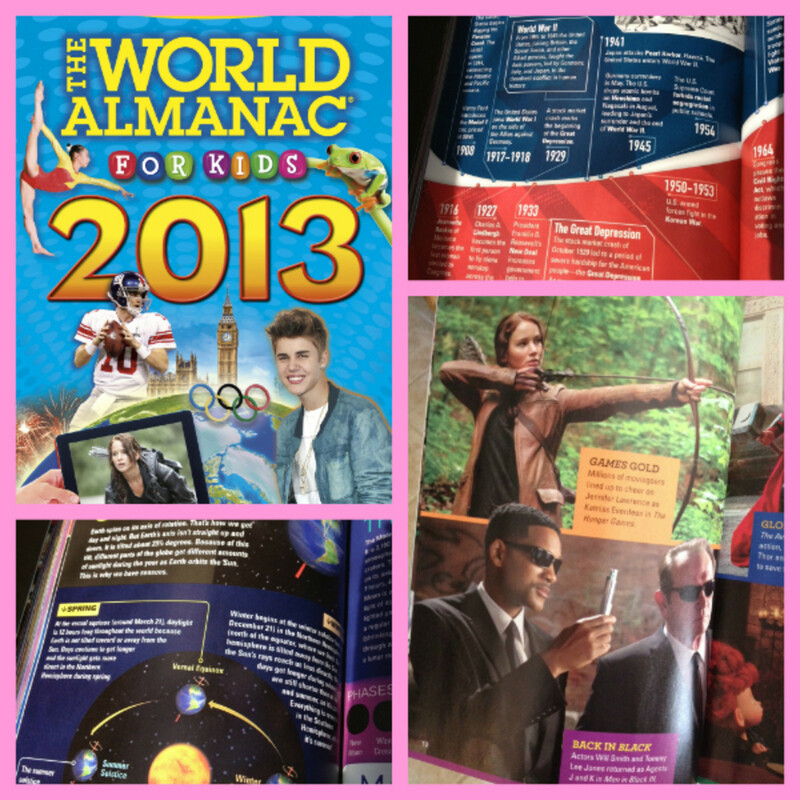 The World Almanac® for Kids is available for $13.99 at bookstores and online. Momtrends was not paid for this Fun Book for Kids: The World Almanac post.